Meet Modest Medusa! My pal Jake draws this wonderful comic strip about his troublesome friendship with a young Medusa. (Yes, that’s her name, and the sort of creature she is.) I recently did this little guest strip for him where they get together for an afternoon at the movies. 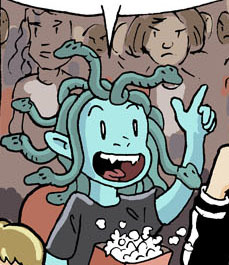 Modest Medusa updates three times a week when Jake’s not too busy attending conventions, designing games, or doing color for other cartoonists. It’s a great all-ages comic filled with fun, innocence, adventure, and more than a few hints of naughtiness. Highly recommended.